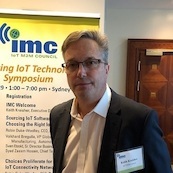 Keith Kreisher has headed the London-based IMC, with 25,000 members the world’s largest and fastest-growing professional organisation for the global IoT sector, since 2014. The IMC’s mission is to bring together enterprise users and OEMs that deploy IoT solutions with technology providers. In addition to its IIoT activities at Hannover Messe, the IMC is the exclusive IoT Infrastructure partner for the Consumer Electronics Show, and the group is currently engaged in developing a set of comprehensive, inter-locking, non-technical guidelines for sourcing IoT solutions. Mr. Kreisher has held senior marketing management positions at business information companies such as McGraw-Hill, Reed Elsevier, and Advanstar Communications, both in the US and Europe. He holds an MBA from Fordham University (New York) and a BA from Georgetown University (Washington D.C.).